Requiem sneaking up on Thanos in the prelude, Infinity Wars Prime. The stories coming out of the House of Ideas do exist in a kind of larger conversation with one another. Marvel’s movies come out at a markedly slower pace, but they’re met with the steady ebb and flow of mini-series that are designed to capitalize on their hype, whether directly or indirectly. That was the case with Rise of the Black Panther and Wakanda Forever, two Black Panther-focused series that dropped earlier this year, and Marvel’s seemingly stuck with this strategy with its current Infinity Wars event. This week’s Infinity Wars #1 opens up with quite the bang that’s sure to surprise anyone who might not have been following the buildup to the issue, but what’s even more potentially fascinating is what the comic might portend for next year’s follow up to Avengers: Infinity War, the as-yet-untitled Avengers 4. Pull up a chair, slip on that tin-foil hat, and let’s theorize a little bit, shall we? 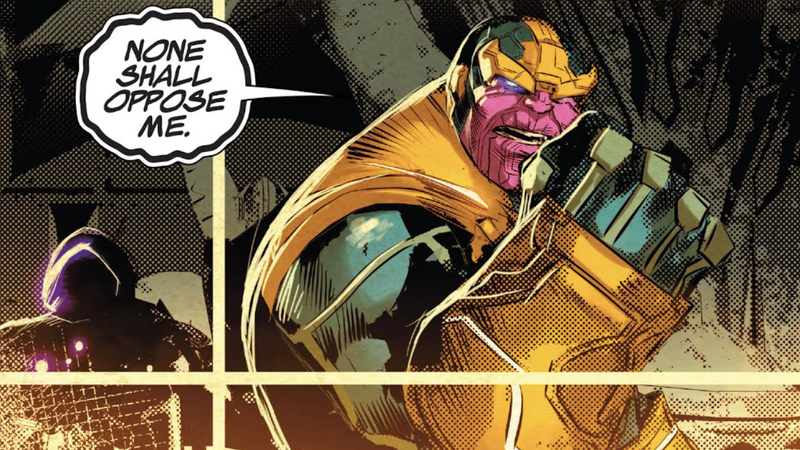 Like all of Marvel’s sprawling events, there’s more than a bit of backstory to consume in order to get the full picture of what Infinity Wars #1 sets the stage for. The most important bits to bear in mind, though, are fairly easy to remember: Thanos has been murdered by mysterious newcomer Requiem, and a new Infinity Watch in possession of the Infinity Stones is trying to decide what to do with the all-powerful MacGuffins. Infinity Wars #1—from writer Gerry Duggan, and artists Mike Deodato Jr. and Frank Martin—finds Captain Marvel (in possession of the Reality Stone), Doctor Strange (Time), Star-Lord (Power), Adam Warlock (Soul), and Black Widow (Space) trying to discover a way to get back the Mind Stone—which is held by the NYC-based, street-level criminal Turk Barrett. The already-dangerous gathering becomes that much more deadly when the masked Requiem arrives on the scene to attack the Watch. Much to Star-Lord’s surprise, it’s revealed that the Power Stone he’s in possession of is a forgery and Requiem has the real deal. The tension on the field isn’t turned up to 11, though, until Rocket Raccoon gets a good shot in on Requiem, managing to knock her mask off and reveal her true identity: Gamora. Gamora murdering Peter Quill in Infinity Wars #1. Gamora’s motivations for stealing the real Power Stone from Peter Quill in Duggan’s recent Guardians of the Galaxy run are complicated, but they boil down to her learning that a piece of her soul is trapped in the Soul Stone’s paradise dimension. She desperately wants that piece of herself back and is willing to do anything to get it—but beyond that, it’s the fact that she’s the one who murders Thanos that’s most interesting. Obviously, Marvel’s comics and the MCU are drastically different places, and a number of Infinity Wars’ key players have drastically different roles and experiences from their cinematic counterparts. The through line between the two stories are the narrative importance and weight being given to Gamora, her relationship with Thanos, and a piece of her being trapped in the Soul Stone. As impossible as it may sound given the way Avengers: Infinity War ended, it’s fairly safe to assume Avengers 4 is going to end with Thanos dead, if not at the very least badly defeated. The question, though, is who will be the one to do it? The MCU’s rules about who can and can’t wield Infinity Stones in the way that could defeat Thanos are a little fuzzy. Peter Quill could, until his encounter with Ego, and presumably, there are other beings out there who might be able to the same. But rather than Hawkeye or one of the surviving OG Avengers suddenly developing the power to hold an Infinity Stone or some such, wouldn’t it be much, much more satisfying if, in the end, Gamora’s the one to do the deed?